The Diablo Summit Stomp 30K was a new event for Brazen Racing this year. 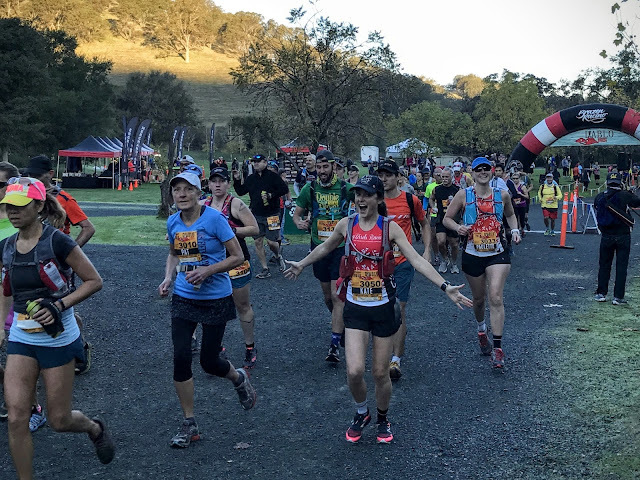 In past years, Brazen has held a race at Diablo in November with the longest distance being a half marathon. 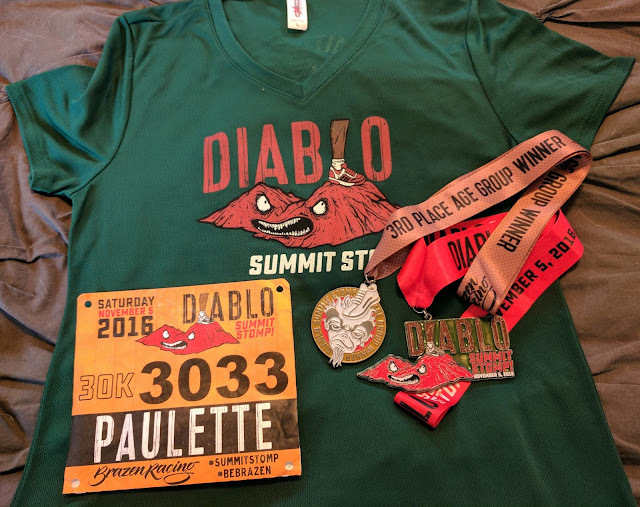 When I saw the addition of a 30K that went to the Diablo Summit, I knew I needed to do it [because I'm crazy]! One of my goals for 2017 is to run in the mountains more, and that means more climbing. 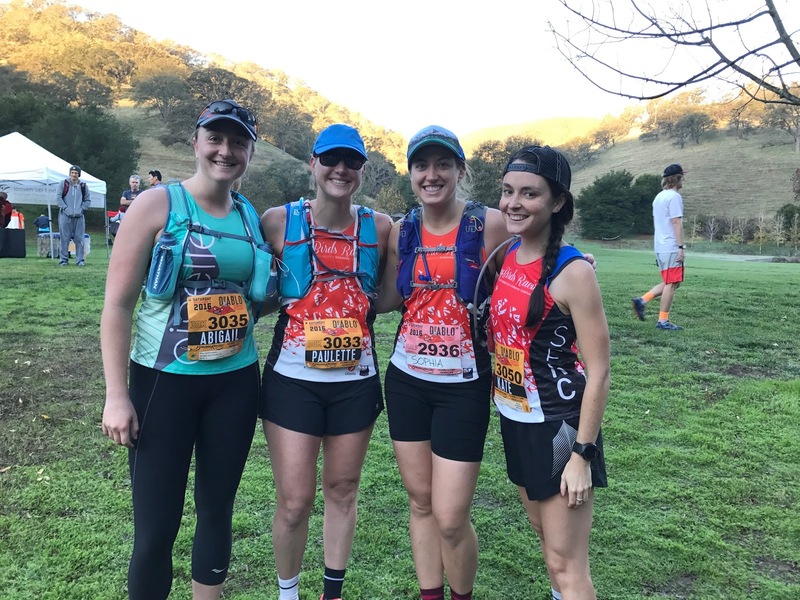 I started preparing myself for that goal this fall with the Brazen Rocky Ridge half marathon (a half with 3900 feet of climbing and lots of steeps) and this 30K, which had 4200 feet of climbing. The main difference of the Diablo event was not the total vert - I've done that in this distance many times - but the extended length of the climb. The race started at Castle Rock Park in Walnut Creek, CA, which had a lot of easily accessible parking. The walk to the staging area from the parking lot was about 15 minutes; had I realized that, I would not have planned to go back to my car after bib pick up as I did. At least walking back and forth kept me warm! I knew a few other people running the race and we chatted before start time. Honestly, I was pretty nervous for this one. I knew I could finish it, but my climbing legs have felt off since this summer and I haven't come out of that yet, even with rest. I worried I would be miserable or feel the need to downgrade to the half. We started running and I let myself focus on my own pace, trying to settle in to a comfortable rhythm. 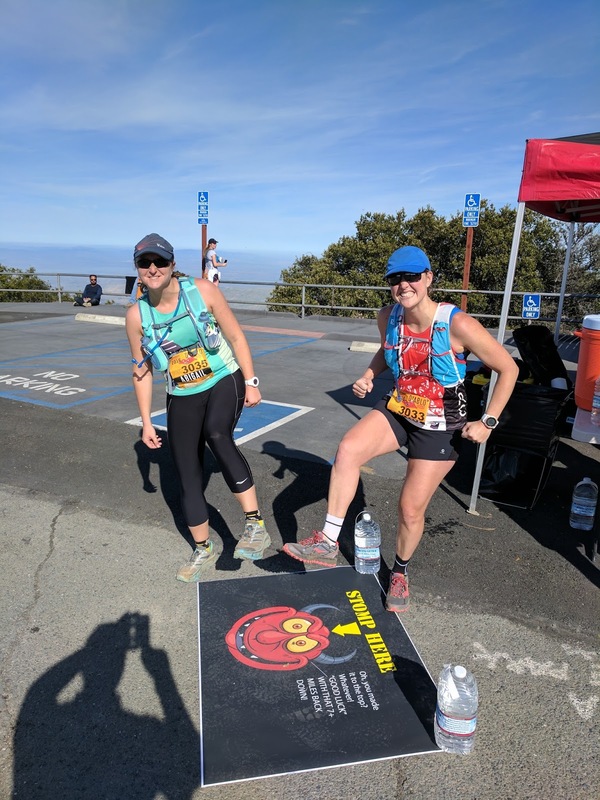 The first 4 miles of the course included a couple of small dowhnills, but from then on it was a pretty intense uphill climb until we reached the summit at 11.5 miles. The first small climbs bothered my legs and cramped my Achilles, but I stopped to stretch and continued on. My muscles finally opened up after 3 miles or so. I was starting to struggle with my uphill speed by mile 7 and even contemplated making a 'Deal with the Devil' to drop to the half at the next aid station, but being near Abigail on the course motivated me keep pushing. I could do this 30K, why was I letting myself have doubts? I moved quickly through the mile 8.5 aid station and didn't give myself time to even consider dropping. I was IN for the long haul. Onward and upward, onward and upward. There were many people around me on the course and it was great for camaraderie and motivation. It was a perfectly clear day and the views were spectacular. I stopped a couple of times to rest muscles that were hating me, and I was frustrated that my glutes wanted to quit. I waited a minute on Abigail who was close behind me and continued on with her as my rabbit. Friends Berke, Kate, and Shannon passed me on their way downhill and assured me the top really was coming soon. The last half mile to the top was extremely tough, but I made it and stomped that summit! 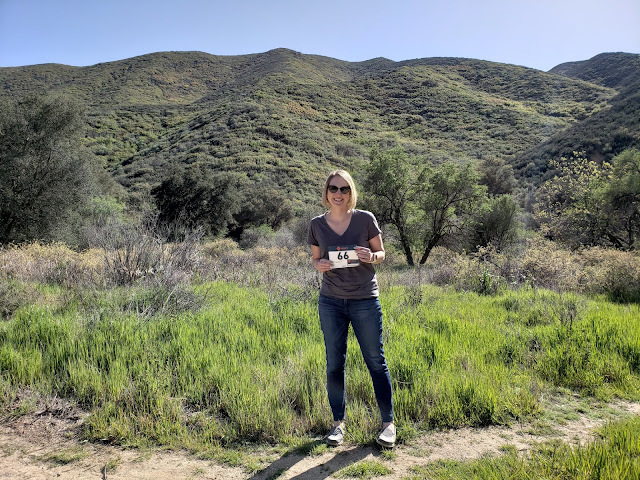 I was ecstatic to finally be there and took advantage of the chance to mix more Tailwind. I stayed at the summit aid station longer than I usually would, but I felt dizzy from the climbing and needed a few minutes to regroup. One might think that finishing the climb means an easy downhill run, but it's not quite that simple. The lungs no longer have to work so hard, but the quads and legs take a beating. Just as the extended uphill was new to me, so was the extended downhill. I find it hard not to hold back on the steeper parts, and 'letting go' to run faster downhill is a skill I'm working on. I focused on my form throughout the descent. The course became much less steep around mile 16, and from there I ran well and as fast as I could to get back to the finish. I passed quite a few people in the last miles and that was a nice mental boost. At 4:41:17, I crossed the finish line a very happy person! Kate and Shannon greeted me at the finish line, and Abigail came in soon after. I was DONE but super happy with the finish and even my finish time (I'd been estimating 4:45, which I beat by a few minutes.) That was even good for 3rd in my age group! This race turned out great overall; it was an intro to longer climbs and I'm thrilled that I accomplished a 30K on Diablo. I'm even more thrilled that I managed an age group medal, which hardly ever happens (and thanks to Kate for finding this in the results later that night, I didn't even check.) There were 9 people in my age group, so I'll take it. And as always, Brazen Racing put on an awesome event. 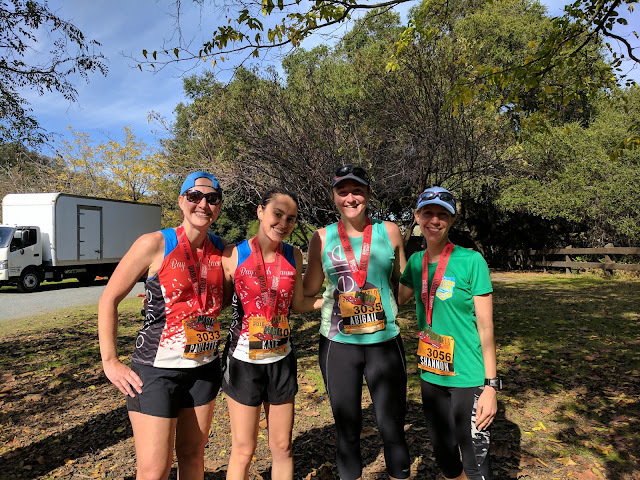 The volunteer and staff support was superb, the course was well-marked, aid stations had everything I needed, and the finish area and food were great. Plus, volunteer photographers provided all of their photos at no charge to the runners. Thank you for everything, Brazen! 30k! holy crap. I was happy when I was able to run a 5k. I've got a long way to go lol. Congrats.